Mrs. Mary Terronez; 8-15-18; Announcement CH-4-08 1940 On many occasions I was asked to go to the U.S. Immigration and Naturalization Office in Omaha, Neb. to interpret for different families, help them process the pertinent forms, explain the various procedures, and help them secure their "Wica" as permanent residents In addition, Mr. White from U.S. Immigration would come to Davenport and he would call on me to interpret for him or write letters to the Immigration Department for information on different matters including citizenship application. I accompanied people to the Mexican Consulate at 201 North Wells, Chicago, Illinois to get their Mexican permits to go to Mexico. Approximately 720 hours were volunteer hours in this area. Sometimes weekly hours. (?) Approximately 80 hours were volunteer directing, interpreting and explaining guideline to people seeking assistence to Mrs. Gaylord, Department of Social Service, Davenport, Iowa. 1949- People at Cooks Point barrio were concerned because they heard a industrial park would eliminate this community neighborhood. The Hispanic American Club endeavored to help answer some of their questions. 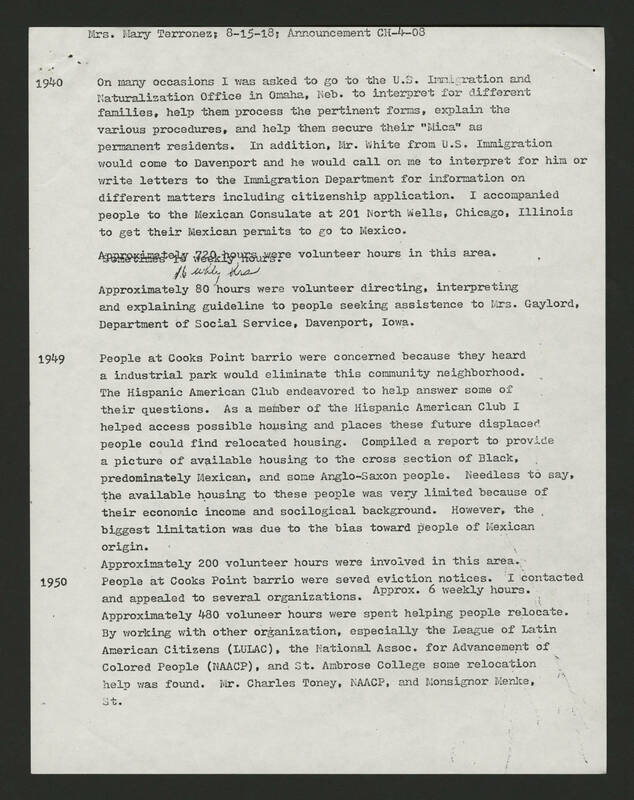 As a member of the Hispanic American Club I helped access possible housing and places these future displaced people could find relocated housing. Compiled a report to provide a picture of available housing to the cross section of Black, predominately Mexican, and some Anglo-Saxon people. Needless to say, the available housing to these people was very limited because of their economic income and socilogical background. However, the biggest limitation was due to the bias towards people of Mexican origin. 1950- Approximately 200 volunteer hours were involved in this area. People at Cooks Point barrio were seved eviction notices. I contacted and appealed to several organizations. Approx. 6 weekly hours. Approximately 480 volunteer hours were spent helping people relocate. By working with other organization, especially the League of Latin American Citizens (LULAC), The National Assoc. for Advancement of Colored People (NAACP), and St. Ambrose College some relocation help was found. Mr. Charles Tonay, NAACP and Nonsignor Menke, St.